Propelled only be wind power, it leaves no footprint whatsoever as it travels between Western Europe and the Caribbean. Its typical cargo includes rum, whiskey, coffee, tea, wine and spices, as well chocolate and cocoa beans. In fact, the ship was in Amsterdam to deliver 15.000 pound of cocoa beans, harvested in the Dominican Republic, to Chocolate Makers — a chocolate factory in Amsterdam. Chocolate Makers is operated by two guys, who pride themselves on running their business in an environment-friendly, sustainable, and fair trade manner. No surprise then that when the Tres Hombres arrived, the cargo was offloaded by a group of volunteers who then brought the bales to the factory using anything from cargo bikes and horse & cart to a golf cart. Incidentally, we tasted our first Chocolate Makers bar at our favorite coffee spot, Al Ponte, which is located just fifteen minutes from the factory. 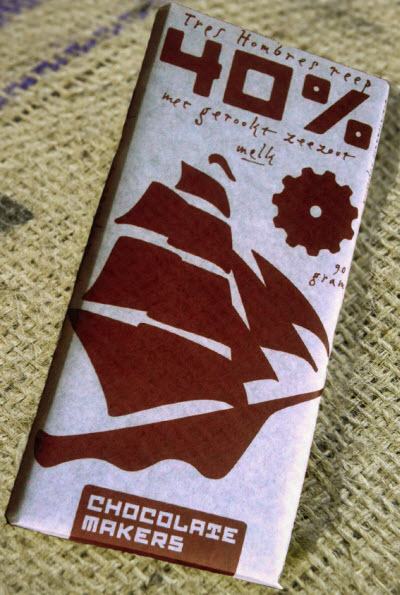 We had their Tres Hombres Reep: milk chocolate with 40% cocoa and smoked sea salt. Wow! We both love ships. Perhaps that’s because Janet’s father worked with the British merchant marine, and I was born on a houseboat. Our home is close to the NDSM harbor, a former shipyard at Amsterdam’s waterfront, the IJ (pronounced as ‘eye’). It’s a great place to see a variety of boats. This is where we visited the Tres Hombres which, as the name indicates, is run by three guys: Jorne, Andreas and Arne. We were only taking a tour of the ship, but we could easily imagine that — under different circumstances (such as better health) — we would sign up as crew members in a New York minute. You can actually do so. Male or female, young or old, experienced or ‘green hand,’ when you sign up you’re guaranteed a unique experience. See the website for more information. Anyway, we toured the ship and at the end we got to taste some Tres Hombres chocolate and Tres Hombres rum. Fantastic stuff! 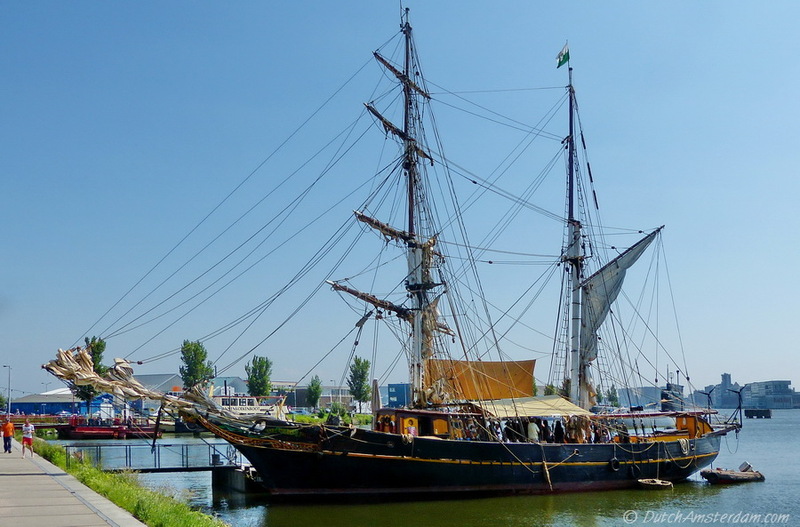 Later that day a rowing team delivered the rum cargo to five Amsterdam cafes — all situated along the canals — in the Tres Hombres sloop. We look forward to seeing this ship again next time it visits Amsterdam.